Thank you to everyone that entered my Softlips Limited Edition Winter Collection giveaway. I used Random.org to select the winner. 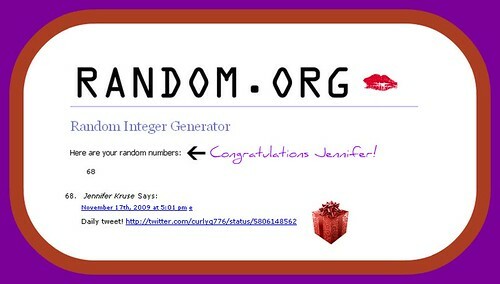 . .
Jennifer now has 48 hours to respond to my e-mail with her information for prize delivery or another winner will be selected. Be sure to check out the other giveaways that are currently taking place. Thank you again to Softlips for making this giveaway for my readers possible.